The verdict for the Eoncore Portable LCD display with LED back-lighting Depth and Fish Finder goes out in the 50/50. Most of the users face problems whether minor or major ones. It is considered to be a much better one for knowing the depth of the water rather than spotting out the fish. There are different fish finders available in the market but the right ones are not always present in front of the eyes. Since they cost much, customers prefer reading on reviews and thoroughly researching before buying the right one. Having said that, we are here to do the research for you and provide you the reviews which are not biased and totally clear for everyone. The Eoncore Portable LCD display with LED back-lighting Depth and Fish Finder Depth is a fish finder which we shall discuss in the review below. Read more to find out whether it should be used or not. Various methods can be used to work out effectively with the portable Eoncore LCD Depth and Fish Finder. You can either fix it to the boat hull or use a float on the cable to mount the sonar inside the water or fix it on a pole and move towards the desired position or you can cut a hole in the ice and place it under water. Eoncore claims that it detects and displays grass, weed, sand, and rocks on the seabed. 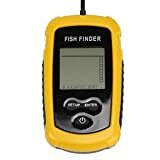 The company also claims that approximate location of fish is identified whereas the customers who used this fish finder said that it could only be used for finding the depth of water. There are two types of readings which are offered in this fish finder one is in meter and the other is in feet. However, users found it difficult to switch between the two different types of units. The range of depth readout ranges from 0.7 meters to 100 meters which make it a good one for finding the depth of the seabed only. Other than that, there is a round transducer sensor which comes with a 7.5m cable that can be submerged into the water to find out the readings. The 45-degree beam angle is also present. The verdict for the Eoncore Portable LCD display with LED back-lighting Depth and Fish Finder goes out in the 50/50. Most of the users face problems whether minor or major ones. It is considered to be a much better one for knowing the depth of the water rather than spotting out the fish. Even though, detailed instructions have been provided, yet many customers felt that it is complicated to understand. Other than that, the unit stays default to metric and many users could not change it easily. These are a few minor issues which were faced. No major issue was faced which means that there were no performance problems other than the mentioned ones. It is a cheap one and you should get it from amazon.com right now!